There are so many things to contemplate when it comes to running a business, whether you are self-employed or the owner of a small business. Learning what mistakes have been made by other business owners is one of the best ways to map out your own business strategy in an effort to run flawlessly. 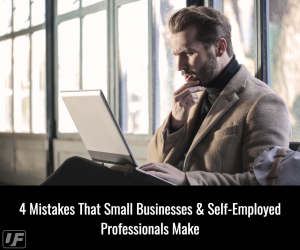 We have done some of the digging for you to discover 4 mistakes that many small businesses and self-employed professionals commonly make. When potential clients seek out a small business to do their bidding, they are looking for innovative and efficient work. Small businesses have a reputation for working hard to offer something that bigger companies do not, and in most cases this is a level of customization. Not only can smaller businesses focus more time on their clients, but they also have to really work to distinguish themselves from the competition. Bigger companies become robotic when dealing with clients and their work is generally mass produced. When you are a small business, you must be wary of getting into a rut, or just following the motions when it comes to producing goods or services. In any business, big or small, there is the temptation to just fall into your routine and forget to focus on delivering personalized, custom work. Larger companies can get away with it more so than self-employed or small business owners can, because they already have a reputation and an abundance of publicity and business. Smaller companies and self-employed professionals have to fight to stay ahead of their competition and earn their following by demonstrating an ability to think innovatively and produce work that is anything but run-of-the-mill. Determining price points is difficult for many startups. There is an ocean of research to perform, in most cases, that leads to the final decision in pricing for goods or services produced by a self-employed professional or a small business. The thought process adopted by many small business owners is that if you run discounts and promotions from the beginning you will get more clients “through the door”. While occasionally running promotions is a good way to rack up more exposure when properly planned and coordinated with holidays and other events, it is no way to consistently run a sustainable business. In the beginning, more than anything, you should be pricing according to the quality of the work. Earn your dollars and reputation by supplying a level of service and substance that will not be found anywhere, or from any of your competitors. The goal is convince your audience that you have something rare of great value and delivering that level of quality to them in an efficient and time-effective manner. Your audience needs to know that what they can expect from your business is beyond anything they could receive at those big fancy and impersonal companies, and that you are worth every penny. This is how you survive the early years and build a sustainable business that will be able to keep the lights on. Maintain your focus on your internal structure. This refers to the effort placed in constantly evaluating your business structure – retraining (if you have staff), refinancing, reengineering and reinvesting. All too often, small businesses and especially the self-employed think in the terms of “set it and forget it” when it comes to their business plan. It is assumed that they already went through the whole debacle of researching, speaking to other professionals and piecing together their plan, so why would they need to check through it again, right? Wrong. Your business will evolve and so will your knowledge of business management. Each new circumstance is an opportunity to learn what works and what not to do. This is especially true of finances. You may have already invested the initial startup cost to get everything up and running, but depending on your type of business you may need to keep reinvesting in things such as; office supplies, on-hand product, rent, equipment, business insurance and licenses, marketing, etc. You can acquire a Small Business Loan or a Start-Up Loan through a variety of sources (like us!) – however another issue that could rear its ugly head is common among small businesses or the self-employed – stating your income. (Mark – if you want to correct or add anything here, please do so). We specialize in dealing with small business and self-employed professionals when it comes to these tricky matters. Issues such as your credit score can even pop up to tangle things, and we can provide guidance to help you get back on track if that happens to be your biggest obstacle. Don’t hesitate to give us a call when you are ready to invest or reinvest in your business. Even if you are thinking, “my business isn’t in the creative industry”, you are required to weave creativity throughout your business, whether you do it personally or if you hire a professional. Every small business or self-employed professional relies on creativity to set them apart from their competition. Creative in the care and customization that you provide to your customers and clients; creative in the branding you use for elements such as your website, logo, social media, and perhaps packaging; and creative in the methods of marketing that you use to promote your business and grab the attention of all the eyes available out there. To make it as a small business or self-employed professional, there is no option but to utilize creativity as much as possible, and if you can’t exercise that part of your brain, hire it.